The year is 558BC and King Croesus is at the height of his powers. He rules over an empire unrivaled in power and wealth and myths and rumours abound about the vast treasuries he has constructed in his palace. How can he not be the happiest person he had met? Was he not ruler of a vast and rich empire? Did he not have a loving queen and a strong heir? Dismissing Solon from his mind, Croesus turned his attention to a threat from the east. The Persian Empire is on the move and Croesus decides he has to confront this threat head on. Leading his army out he comes up against one of histories great conquerors. In my alternative life as a book reviewer I am very lucky in getting some great book to review. Regular readers of this blog will know I tend to only review books I have enjoyed and think other people will enjoy as well. Every now and then I will get a book that is so good that I’m almost too scared to review it in case readers think I have been paid by the author or publisher. The Last King of Lydia is a book that falls into this category. This is a book without large set piece battles or gallons of blood and core but studies the human psyche and emotions. The first half of the book deals with Croesus as king and how he deals with ultimate power and the relationships he builds with his family, subjects and slaves alike. We watch as greed and power lead him to gamble his vast wealth and his very kingship in a confrontation with Persia. The second half of the book then covers how Croesus handles the humiliation of losing everything he held dear and the loss of status. I particularly enjoyed the relationship between Croesus and Cyrus, the Conqueror and the conquered in an uneasy alliance. The personalities of the two men couldn’t be more different and I think that is a compliment to the writing. Cyrus is strong, dominate, ruthless and power oozes from him, he make Croesus seem weak and feeble and a bit pathetic. It is a beautiful comparison between someone who believes he is all powerful coming up against a true giant of a man who will make his mark on history. This is a beautiful re-telling of Herodotus’s famous tale and I don’t think I can recommend it highly enough. It may only be April but this astonishing debut book from Tim Leach is without doubt my book of 2013. 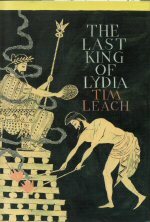 The Last King of Lydia is out now in Hardback from all good bookshops. Father of two girls with two passions, Reading and history. If I can combine the two then I am a happy person! This entry was posted in General, Pre History and tagged Croesus, Cyrus, Herodotus, Lydia, Persian Empire, Solon. Bookmark the permalink. Always look forward to your book reviews Nick.